On December 20th of last year, I made the attached recording at a subway station in Mexico City. On it, the normal voices of travelers resound a bit more loudly than usual through the expansive above-ground station. There is shouting and a man on a megaphone. Other organizers (like the one you’ll hear on this recording) were jumping turnstiles without paying and explaining their protest to others. 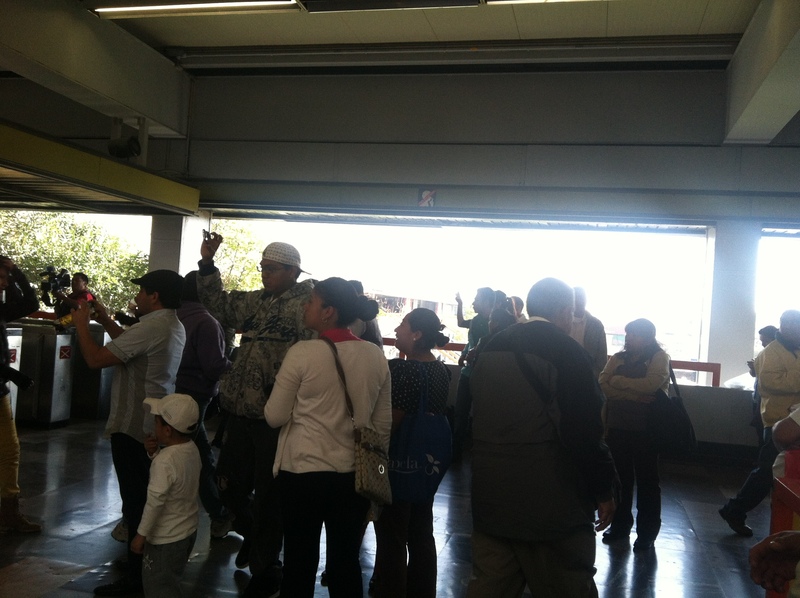 The transit protests came to Metro Ciudad Universitaria as they came to many Metro stations in Mexico City this winter. Police stood by to watch, a coterie of journalists followed alongside them with boom mics and video cameras, and a small crowd held their phones up to take photos. Ciudad Universitaria, or CU, is a busy Metro stop at the southern end of the Green Line that runs all the way down from Indios Verdes in the north of Mexico City. It is a main access point to both the working-class neighborhood of Santo Domingo (made somewhat famous by anthropologist Matthew Gutmann in his 1996 book on masculinity in Mexico) and the massive campus of the Universidad Nacional Autónomo de México, which sit to either side of the station, as well as to buses that take passengers even further on. Metro prices have been low. In 2011, when I first began to visit this city, a ticket cost $3 MXN ($0.26 USD at the time)* with support from the municipal government. That rate is still available– to female heads of households, unemployed people, and poor students willing to stand in very long lines and file paperwork. They are not, however, available to anyone else. At the end of 2013, Manuel Mancera’s PRD city government put it to a vote and 55.7% of voters supported an increase in fares to cover basic maintenance and expansion of the Metro system. Fares went up to $5 MXN from $3 MXN. It’s not much: in USD a ticket costs $0.38 now. But it’s enough. Minimum wage in Mexico is $64.76 MXN per day in high-paid areas like Mexico City, which does not allow much room for even a small increase in the cost of daily transit. The chart to the right, which demonstrates the constraints of living on such a budget, made the rounds on Tumblr. I’ve found notes all winter stuck to official notices about the fare changes in Metro trains, listing hashtags or naming stations, dates, and times for people to come and jump turnstiles. Which leads us back to the protest at CU underneath the huge mural of Mexican revolutionaries. The protest I saw was nonviolent, like many other transit protests written up in the local papers this winter. The sounds you can hear on this recording were made by maybe 30-some protesters, most dressed like students. They echo a bit threateningly, and were an overwhelming sensory experience for me after a day in the archives. All the official reports I’ve read are about peaceful demonstrations. In the past months, though, I’ve also heard stories about protesters abusing people verbally and physically when they chose not to hop turnstiles and join in during an event like the one I’ve recorded here. These stories are apocryphal but ominous. I paid my fare, and so did plenty of the people in the photograph above, standing with their cell phones aloft. But do you think you could hear it, in this recording, if the protesters were harassing passersby? I wish I had recorded more than the urgent voice of the protester here– I wish I could present you with eye rolls, sympathies, and worries that come up in conversations about these protests, too. The stories of violence are, I think, an undercurrent to everything that I’m giving you to listen to here. I heard the first one only a few days after I recorded this. The rumors, though, are harder to capture than the roar. *The $ sign is used to designate prices in Mexican pesos the same way it is used to designate prices in dollars. This entry was posted in Cities, Mexico, Uncategorized and tagged metro, Mexico City, transit protest. Bookmark the permalink. 1 Response to Fare protest! I wonder how this may be connected to the ongoing free public transit movements in Brazil like Movimento Passe Livre (Free Fare Movement) that helped ignite–or at least was an important part of– the protests in Brazil last year. See sites like http://tarifazero.org and http://farefreebrazil.blogspot.com for articles, updates, and songs about fare increases, urban mobility as right, and jumping turnstiles in Brazil.